Description: Advanced Log Monitor is a log management solution that monitors log files from any program, database or device and notifies you by email when a specific event occurs (Warning, Firewall attack, Hardware failure or anything else), can quickly and cost-effectively monitor your mission-critical servers, databases and applications and notify you of any problematic or unusual activity. Description: Advanced Network Search is a network search engine for Windows. Sharing/SMB and FTP share. It indexes network structures to achieve faster searches. The program incorporates a built-in web-server and convenient web interface, which enables users to enter intuitive search queries. The program's MP3 search function includes parameters such as Album, Artist or Song name. Advanced Network Search is an excellent fit for corporate and home LANs. Description: AirGrab WiFi Radar is a tool to display information about Apple Airport base stations and other WiFi (802.11b/g/n) wireless access points. Using AirGrab WiFi Radar you can determine most popular WiFi channels and select optimal channel for your WiFi network. Encryption status of network shows WEP, WPA, WPA2 modes of all immediately available WiFi networks. Description: Alchemy Eye is a system management tool that continuously monitors server availability and performance. In the event of network errors, Alchemy Eye can alert the network administrator by cell phone or pager BEFORE problems get seriously out of hand. This helps protect your company's data and reduces the likelihood of costly network failures. If a server goes down, Alchemy Eye automatically notifies the network administrator. Description: Alchemy Eye PRO is a system management tool that continuously monitors server availability and performance. In the event of network errors, Alchemy Eye PRO can alert the network administrator by cell phone or pager BEFORE problems get seriously out of hand. This helps protect your company's data and reduces the likelihood of costly network failures. If a server goes down, Alchemy Eye automatically notifies the network administrator. Description: Alchemy Network Monitor monitors your network servers and business-critical applications availability and performance and immediately alerts you if a server gets out of order. Alchemy Network Monitor can also perform certain actions (e.g. launch an external application or execute an SQL query) when a server stops responding to the programs requests and maintain a detailed server monitoring log. Description: While your hosts are hanging-up,your income is falling. Stop it with "AlertPing"! Alert Ping verifies accessibility of your host computers! Build a list of TCP/IP devices (computers, printers, and others) to verify their network connections. AlertPing periodically pings each device. After issuing a ping request, the program waits for a reply, if it receives a failed ping request, different alarm and alert messages can be sent. Description: AthTek IP - MAC Scanner is the world leading tool for network management and network analysis. It provides IP scanner and MAC scanner to help you get the connection details freely. It also provides a ping tool for testing the access to network. 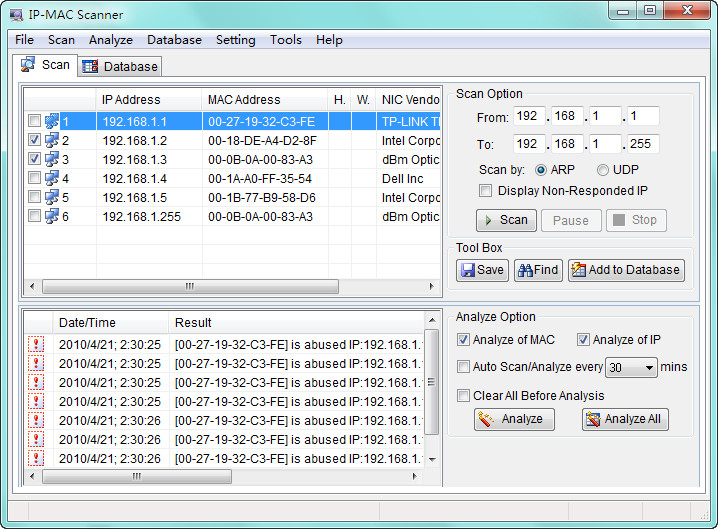 The scanned IP or MAC can be analyzed by AthTek IP - MAC Scanner, to track the illegal users. Remote control functions enable you to wake up, shutdown and send messages to another computer on LAN.